Polymer clay comes in a variety of colors and is used in so many ways, but sooner or later you’ll likely want to create a metallic appearance. Maybe you’ll want to make metallic accents on a sculpture. Or maybe create a metallic bezel or some jhumkas (Indian earrings). Perhaps instead you want to take some ideas from the world of precious metal clay and create some charms or a toggle or even a shawl pin. How would you create a metallic look on polymer clay? Taken with the light coming from behind so you can see the shine, here you can see how well these treatments give a metallic look on polymer clay. There are many ways to create this metallic look, and I’ll introduce you to some of them here. Each strategy gives a slightly different look and you might want to choose one over another for certain applications. But before you invest in new products, which ones create the most convincing metallic look on polymer clay? Below I’ll show each one, explain how I created the effect, and show pictures of it. Hopefully this will give you a good idea of which approach you want to take. With the light coming from behind the camera, the reflections are minimized here and you can see how well each of these materials covers the black clay. Before we get there, though, I want to say a word about the colors involved. Nearly every craft material contains a version of gold in its color range. But those golds are seldom the same gold. One might be an antique gold, another a warm gold, yet another a brilliant sparkly gold. Because each of these materials naturally comes in a different color of gold, try not to compare the actual color of the gold. Try to compare things like the coverage, the sparkle value, the texture, and how convincing the metallic effect is. I chose gold for my comparisons, but several of these products come in a variety of metallic colors. Metallic polymer clay is a translucent polymer clay that uses mica powder as its pigment. Many brands of polymer clay carry gold and silver in their range. Pearl clays are also in this category, and in reality metallic clay is just “gold” pearl clay. This is gold Kato polymer clay, completely unfinished. As you can see, the color is quite orangey and not particularly and metallic looking. This type of clay itself doesn’t create a very convincing metallic look. It’s a material that’s much better when used in mokume gane effects where the gold colored particles are spread out and catch the light, or when used in the mica shift technique. Rub ‘n Buff has been around, and has been used with polymer clay, for many years. It’s a wax-based cream that comes in a little tube. Here I used the color called “Gold Leaf”. Originally designed to create the gold highlights on picture frames, it works great as a highlight on many materials. Just lightly brush it on (I use my finger), let it dry, and buff it to a high sheen. For this test, though, I used my finger to coat a raw sheet of black clay with Rub ‘n Buff. I let it dry a few minutes, then pressed a stamp into the clay. After baking I gave it a light coat of a sealer. Unlike most of the products in this article, Rub ‘n Buff contains actual metallic particles. This means that it will tarnish and turn green over time. It also means the sparkle is a bit more dull. Rub n’ Buff gave excellent, albeit rather matte, coverage. It didn’t really seem to need a sealer, I just used one to try to make the sparkle come out a bit. It didn’t, really. Similar to Rub ‘n Buff in that it’s wax based and made with metal particles, Gilders Paste comes in a small tin similar to shoe polish. I rubbed this on a sheet of raw clay and then pressed a stamp into it. I sealed it after baking, just to intensify the sparkle. Gilders Paste doesn’t tent to stick to baked clay very well (it scratches off), so adding it to raw clay is a much better strategy. It stays better when baked on. This is the color called “Inca Gold”. It had a surface that almost looked burnished and I liked the warm glow it had, probably more similar to an old brass. It’s not very sparkly when used like this, but I know it works really well as an antiquing treatment that adds a subtle shimmer. Gilders Paste has a full range of metallic and also non-metallic colors and shades, and thins with turpentine. By the way, the name of this product really is spelled “Gilders Paste”. There is no “u” and there’s also no apostrophe. Gild, in this case, refers to the word meaning to coat something with gold. A very different product from the previous two, Inka Gold is a paste made by Viva Decor that is sometimes described as a paint. I seldom use it as one, though. I tend to use it as a highlighting accent. Although it’s wax based like Gilders Paste and Rub ‘n Buff, it is water soluble rather than petroleum based. It’s also mica based and not metal based, so it’s very shimmery, and it comes in a wide range of bright and pastel colors. I spread the Inka Gold onto a raw sheet of clay and then pressed a stamp into it. I then baked it and sealed it. When spread onto a sheet of raw polymer clay and allowed to dry, Inka Gold can be used as a crackle paint by then running the sheet of clay through the pasta machine. If you look closely in the picture (click to make it bigger), you can see where the Inka Gold crackled a bit from the pressure of pushing the stamp into the clay. There isn’t very good coverage, but Inka Gold does give a very bright shiny metallic look. Pearl Ex is a brand of mica powders that comes in 48 shimmery colors. When brushed onto raw clay, these powders stick immediately and can be burnished to create a very smooth metallic finish. Mica powders consist of minute flat particles of the mineral called mica and they’re responsible for many of the shimmery effects you see in cosmetics and art materials. If the flat particles are all jumbled, the light scatters, making the surface seem dull. But if you can lay the particles down flat, like when happens when you burnish Pearl Ex onto raw polymer, the effect is far more shiny than what was created in the previous methods. In this sample, I smoothed Aztec Gold Pearl Ex onto a sheet of black clay, then pressed the stamp into it, baked it, then sealed it. The effect was very good with excellent coverage and good reflectivity. It gives a very good metallic look on polymer clay. It does need to be sealed after baking, though. True gold metal can be beaten very thin and applied to decorative objects such as paintings and artworks, religious items, building domes, and even the lettering on an old book cover. Real gold is very expensive, so most crafters use a gold-colored aluminum or copper metal leaf instead. I used Mona Lisa brand metal leaf, in the gold color for this sample. First I stamped the raw clay, then I applied the gold leaf with a soft brush, pushing it down into all the nooks and crannies. Metal leaf adheres to raw clay without using an adhesive. After baking, though, I did seal this with Varathane so that the gold leaf wouldn’t be scratched off. Because this is a real metal sheet, and the unbroken surface area is large, the shine from this sample is certainly the most convincing for a bright metallic look on polymer clay. Metal leaf does not stretch, though, so the sheet cracked and did not adhere deeply into the design. It also rippled a bit during baking, leaving a slightly crazed appearance. While this is a really cool effect, it might not be exactly the kind of metallic look you’re going for. Like with Inka Gold, you can get really great crackle effects with metal leaf. Because it doesn’t stretch, you can adhere it to a sheet of raw clay and then run it through the pasta machine to create crackles. Metal leaf also works nicely in between the layers of mokume gane. These last two samples were painted with acrylic paints that scored highly in my test of metallic acrylic paints on polymer clay. This sample is Deco Art Dazzling Metallics paint in Glorious Gold. I painted three coats onto pre-stamped, unbaked polymer clay. I did not use a sealer. As you can see, the color is excellent, the coverage good, and the metallic shine effect is wonderful. This paint comes in many bright colors and is a phenomenal value for the money. It gives very high shine, far greater than what I thought acrylic paints could do. I think it’s even nicer than the much-loved Lumiere paint. I like this treatment the best for creating a metallic look on polymer clay. The effect is great and the ease of use can’t be beat. It cures well on polymer clay, it has a good surface, and it’s easy to apply to any shape or texture. Very versatile. There are many brands of metallic acrylic paint. Not all acrylic paints will completely dry on polymer clay. Most are just fine, but a few brands will remain slightly sticky or tacky. Always test a new paint with the brand of clay you use to make sure they play nicely together. It’s better to find out problems before you paint a beloved creation. Made by the German company Viva Decor, the line of Precious Metal Colors is marketed as a varnish and not a paint. I suspect this is a translation issue because this isn’t a varnish as we know it in English. (And in Europe, nail polish is called nail varnish, so it’s a language difference.) It is a brilliantly pigmented paint filled with mica particles. The gold color has quite large particles with extremely bright reflectivity that gives almost a glitter appearance. I’m not sure this gives a metallic look, exactly, because it’s really a bit too sparkly to be gold metal. But it’s sure impressive. It doesn’t give a good coverage on black clay, there’s still some show-through. The other colors of this line of paint have smaller particles, though, and are much less garish. I didn’t include this in the original test, but metal powders are another way to go here. When applied to unbaked polymer clay (as you’d do with mica powders), metal powders give a rich, luminous, glowing shine. They still won’t look like polished chrome-like metal, but you will have a richer appearance than the above methods. You can buy real metal powders in a variety of metal colors from Harryman Designs. And if working with powders intrigues you, check out my Guide to Powders. 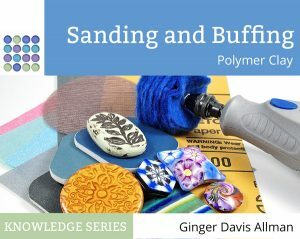 It covers mica powders, metal, dyes, and pigment powders, which are all very different materials, and explains how they work with polymer clay. Check it out here. What Gives the Best Metallic Look on Polymer Clay? For the most convincing metallic look on polymer clay, you’ll need to apply something to the surface of the clay to give a metallic color and enough metallic shine. Metallic colored polymer clay, while lovely for other things, won’t give a metallic appearance. Wax based products that contain real metal flakes, such as Rub ‘n Buff and Gilders Paste are wonderful for creating an old-world or subtle antiqued metallic accent, but not as good for creating the bright shiny look of polished metal. I think they would be nice, though, as accents on the top of metallic clay to give an old world feel. Inka Gold, like the other wax based products, is better when used as a highlight or accent to create a metallic shimmer on something that’s already metal colored. It’s bright and shiny, almost like a frost. Acrylic paint, metal leaf, and Precious Metal Colors all give a bright, shiny metallic look on polymer clay. However, they give quite different results, each with a very different character. Think about the type of metallic look you’re trying to achieve and let that guide your choice for what product to use. Each of these products is a wonderful one to use with polymer clay for a variety of effects. Hopefully this helps you pick the one that gives you the results you want. I left out one really promising product because I haven’t yet purchased any, and that’s metallic Pan Pastels. I hear that they’re rich and deeply pigmented and they stick to the clay very well without leaving spillover like Pearl Ex can do. I’m hoping to get my hands on some soon. Here are the products I purchased for these tests. To seal the Rub ‘n Buff, Gilders Paste, Inka Gold, and Pearl Ex, I used a product called “Final Coat“. I’m experimenting with it right now to see how to holds up and how well it seals mica powders. So far it’s quite promising. I received a sample of it from Wendy Orlowski of Shades of Clay. And if you put the treatment of choice on gold polymer…or another color the effect is different! So many choices. How rich we are. Thanks for your efforts on our behalf to help us create. You are such a problem solver! Yes, I should have mentioned that. I put them on black to show how much coverage there is. But if you use a complimentary base color, the effect will be a lot more luxe. We are rich indeed. So many possibilities, and it’s fun to play. Fabulously helpful as always. I love Pearl-ex but am very interested in Deco Art Dazzling Metallics, especially since they don’t need a sealer. I’ve always been curious about Pan Pastels myself.Thanks again! I keep hoping to find the Pan Pastel set on sale somewhere. Gotta save those dollars! Yes, the metallic acrylic paints do very well, and that particular brand has a wide range of gorgeous metallic colors. I saw a model someone made recently and I thought it must have been airbrushed, like car paint, but it was this paint instead. Very beautiful. Thank you Ginger for your research and then sharing it! I find that the metallic PanPastels don’t stick as well as the regular PanPastels. Applied to raw clay, then cured, that is…..fine if you just seal them, but I am always putting on multiple layers of this and that! So just know that and make the metallic PanPastels your last layer! Very good to know. Thanks Claire. I wonder if they’d be worth having, or if my mica powder collection gives enough functionality. Yes, you’d probably like them, because they are so different to mica. I am not a huge fan of mica except for certain applications. They go on beautifully, just like regular PP. And I am a big fan of having different products because they all have slightly different characteristics. One example of this that leaps to mind is Gilders paste, which is great when you DON”T want crackling after rolling or stretching a veneer – just a beautiful diffused golden background. Useful, and not over the top in your face metallic, but there, none the less…. Thanks for a great review, as usual! I use Pearl-Ex and Gilders Paste and love them both. I hope you can find sme PanPastels. I’m anxious to see what you think of them, especially if they aren’t as messy as the Pearl-Ex. I have some regular colored Pan Pastels and I recommend them highly. They are very densely pigmented, though, and lay down a lot of color. Which is good, but not for every technique. They’re unlike anything else. thank you Ginger. great article. Thank you Ginger …. This has been so helpful! I also am keen to try the metallic PanPastels. Don’t know if we have them in Australia yet ….. Will research. Very comprehensive article, as always! I’ve had very good results with metallic alcohol inks as well- I’ve tried Pinata and Adirondack. Thought it was worth mentioning since the inks are different from the products mentioned here. I was wondering if you’d tried Christi Friesen’s line of metallic paints? I have some of them and was today, pondering if I should buy some of the colors I don’t have (WHY didn’t I buy the iron one? It’s the only one that can rust). I paint as well as sculpt and the Swellegant paints can do both and I like that since they have real metal bits in them they can rust or verdi gris without a faux effect. Love your site and all you helpful tips! I have not used the Swellegant paints, but I have used another brand that works on a similar principle, called VerDay. Here’s my review of those paints on polymer clay. I think Swellegant would be even more cool because of the dye oxides and the increased number of effects. Totally fun. Here’s my VerDay review. After you paint the raw clay piece with gold acrylic paint, do you then bake as usual? Is there anything you do differently as far as time or temperature? Do you seal the piece after baking? Yes, just bake as usual. And no, you don’t have to seal polymer clay if it’s been painted with acrylic paint. Sealer is essentially paint without pigment. The only time I seal or varnish painted polymer is if the paint stayed a bit sticky. Varathane is a non-sticky varnish and it can fix a mild case of sticky paint. How do you burnish the mica powders on the polymer clay? Will a fingertip work or do I need to use a tool? Actually, a fingertip works the best. Wow! Thank you so much for the tutorial! I was stuck on how to do dollhouse-sized coinage (tiny coins for treasure chests). I looked at metallic Sculpey but I didn’t think it looked metallic enough. It never occurred to me to simply paint gold acrylic paint onto an unbaked polymer clay coin blank, stamp it and then put it in the toaster oven. They turned out fantastic. Little 1/4″ coins with impressions on both sides, looking like tiny pirate gold doubloons! I was able to get really good results using “Accent crown jewels” metallic acrylic by Koh-i-Noor. It only needs one coat for good coverage on polymer clay. Sounds like an excellent project. And a lot of fun. Thank you this article is very helpful, I will try out the dazzling acrylic line. Hey Ginger and fab ladies!! Thanks for this fantastic post!. I have never worked with clay but I am in serious need to start designing my own leaves with a very strong and shiny metallic effect. I design headpieces and need to recreate different metal colors and effects. They need to be water resistant and have a very luxurious look. 1. Inka Gold or Gilder Paste? 2. If my leave is about 2mm thick, will it break? 3. Can I mix Gilder Paste with Pigment Powders? Any recommendation is more than welcome! I would use metal leaf and coat with Varathane. All paints, powders, and pastes rely on mica particles and therefore will not be as shiny. This is such a well written, informative article! Thank you. Ginger! I’m just getting started with polymer clays and you’re an amazing resource! Thanks for sharing all of your hard work and knowledge. Have you tried applying gold leaf to baked clay? I’m using the Mona Lisa metallic “gold” leaf kit and I’m concerned about whether the adhesive size in the kit is compatible with the sculpey I’m using. The leaf on my little pendants smears off so easily, even after weeks! I suppose the sealant in the kit could also be blame… or even the Rustoleum satin spray sealant I used before I knew any better. I’m keen to try the Decoart Metallics paint now, as this would eliminate my issues! Well…many glues can be impacted by the plasticizer in the clay. So it is very possible that the adhesive sizing is being softened. And sealants…always an issue. Try using polymer clay safe varnishes to glue the gold leaf down, it might work better. Thanks, Ginger! I’ll re-read your article on the best glues for polymer clays for some suggestions. I wonder if the adhesive sizing is softening the clay… It will require some experiments! Excellent comparisons! This is exactly what I was looking for! Thank you! Thank you so much for this. I used mica powder on raw polymer clay. It looked beautiful when it came out of the oven but after applying Duraclear Ultra Matte varnish, it lost much of the initial shine. Can you recommend a varnish or sealer that is not super glossy but does not remove the shine of the mica powder? I would choose any of the satin or semi-gloss varnishes that reviewed well in this article: https://thebluebottletree.com/testing-polymer-clay-sealers/ It matters what brand of clay that you’re using, so choose a varnish that scores highly for the clay. This is a very informative article. I was just wondering, I want to use gold leaf metallic paint on raw polymer clay and bake it in a fan oven but I don’t know if it’s safe to do so, it’s highly flammable, not to go near fire. Would it be safe to bake in an oven? Paint is only flammable before it had dried. Once it’s dry, it’s no longer a fire danger. It can burn if you expose it to high heat, just like anything can. But most paints are perfectly fine in normal polymer clay baking temperatures.